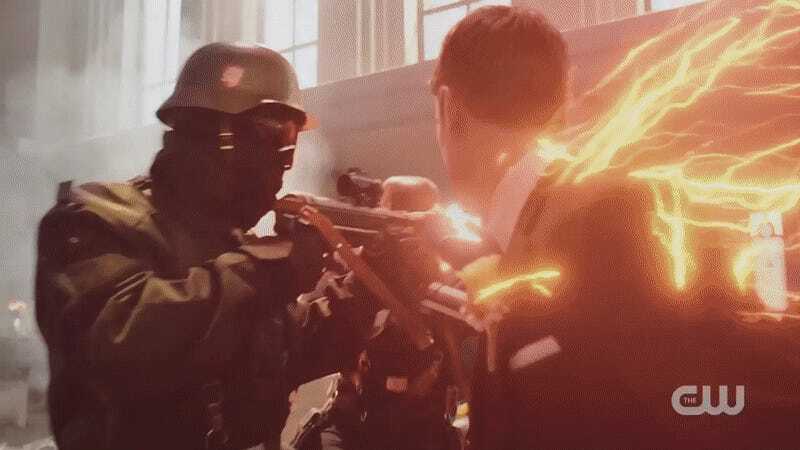 The first half of the CW’s massive crossover event Crisis on Earth-X aired last night, and it was pretty much 80 minutes of superpowered delight. There was so much to love, that honestly, all we wanted to do was breathlessly recount our favorite moments. So here they are, in all their glory. Asking any big superhero mashup production to corral oodles of stars to run around in a major fight scene is enough of a nightmare—even more so on a TV schedule and budget. 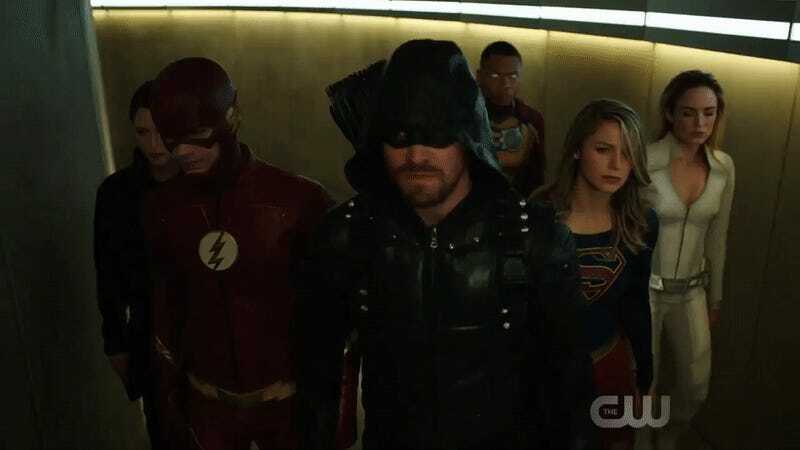 But Crisis on Earth-X went all the way out to give us some of the most fun and satisfying action the CW/DC universe has ever seen. From the fabulous wedding fight to the wholesale Nazi murder that went on in episode two (so good they literally had to get Ollie concussed just so you could see it in slo-mo too! ), this crossover has so far managed to excellently use its cavalcade of superhero superstars to excellent effect. Killer Frost gave herself an ice sword! Wally threw bullets back into their guns! Supergirl does a Hulk clap! 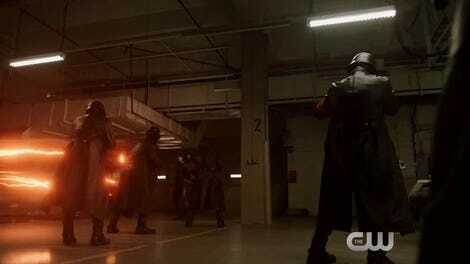 Firestorm blasts about a million Nazis! Sara Lance and Alex Danvers team up and take down Earth-X Prometheus hard! Vibe teleports Green Arrow to stop the Earth-X archer! Seriously, the many action scenes in the first half of Crisis were huge and great and everyone got a chance to be extra-awesome. Crisis had some fun with its references to the past crossovers—Dominators, so last year!—but its most touching was Barry asking Kara to sing at his wedding, after learning about her vocal talents during the delightful musical Flash/Supergirl teamup. Her song choice being “Running Home to You,” the ballad Barry sang to Iris when he proposed in that crossover, was perfect, as was the whole wonderful moment of Barry and Iris’ wedding finally getting under way. If the song didn’t have you teary eyed, Barry’s big puppydog eyes welling up when he turned around to see Iris in her dress absolutely should have. It’s almost a shame the Nazis showed up. Only almost though, because the bit where they got beat the hell up was delightful, too. ...and has her first one-night stand. While this could have been included just for its prurience, Crisis made it much more than that. One of the event’s best aspects is how all its myriad characters are still going through the journeys seen in their normal shows. So Alex is still recovering from breaking up with her fiancée Maggie, still hurting, and still prone to drinking a bit too much to avoid thinking about it. Of course she’s going to pound some scotch at the wedding reception she’s been dragged to by Kara. And of course Sara, a woman who had no compunction about sleeping with King Arthur’s wife Guinevere, has no hang-ups about hook-ups. But when Alex wakes up the next morning, she’s sort of horrified to realize she’s had her first one-night stand. Kara finds it adorable, but Alex has only had one sexual relationship since she realized she was a lesbian, and that was an uber-committed relationship that nearly resulted in marriage. Of course she’s freaking out! Of course she feels guilty for having a casual hook-up! It’s just wonderful, and actress Chyler Leigh continues to knock it out of the park, which is why I’m super-invested in Alex Danvers’ personal life. Also, I think Sara’s chill attitude is going to help Alex heal a bit, which will be wonderful. But even if she doesn’t, Sara casually asking Alex “How’s your bottom?” after she fell out of bed that morning is divine. I’m always happy for actor Colin Donnell to stop by Arrow; Tommy Merlyn’s brotherly relationship with Oliver Queen was one of the strongest in the series, continuing even after Tommy died saving Laurel Lance in the season one finale. It was very cool to see the Earth-X Prometheus pull off his mask to reveal Evil Nazi Tommy, to Oliver, who is completely stunned. A simple gag, done brilliantly—the team responds to the Earth-Xers attempting to break into a research facility, so Kara zooms away in the sky to get there, Barry dashes after her... and then they have to wait. Because Oliver, on his bike, does not have superspeed like his friends. Ollie sternly lecturing the two of them about this fact was delightful, but it was made even better by the totally unnecessary wheelie he pulled during his eventual arrival. Poor Ollie, always feeling like he’s compensating for something. From the very beginning, The DC/CW’s Green Arrow was positioned as basically a bow-wielding Batman equivalent. The series has softened that a great deal over the years, but there was a classic Batman/Superman moment that played out to perfection in Crisis. When Supergirl’s doppelgänger scoffs that Ollie’s arrows can’t pierce her skin he, of course, pulls a kryptonite arrow from his quiver (though its tip was covered with, presumably, lead before it was shot). Our Supergirl’s reaction was pitch perfect and an obvious call-back to the many times Superman has yelled at Batman for keeping bits of kryptonite around. It was wonderful. We knew Jax was upset about the prospect of breaking up Firestorm, so much so that Stein tries to come up with a scientific fix to give him new, albeit boring, superpowers. But Jax finally told Stein the real reason he’s angry over them splitting up Firestorm and it’s FEELINGS. Dad feelings to be exact. It was so fantastic to see them share that. Oh, those new, albeit boring, superpowers? They were basically low-quality Spider-Man powers to the extent that Jax actually asks Stein, “Are you trying to make me Spider-Man?” Jax evens asks if Stein’s potion would give him “spidey-sense.” There have been a few allusions to Marvel heroes in the DC/CW shows—a couple of episodes ago I think Cisco mentioned something about someone “hulking out” but this is concrete, undeniable proof that Marvel Comics are doing just fine in the DC/CW-verse—and that some of our heroes are fans. Mick “Heat Wave” Rory has met Caitlin Snow before—tried to kidnap her, in fact—but it’s only when Earth-X Nazis invade the wedding that he gets to meet Killer Frost. As might befit a man who perennially wields a flamethrower and used to partner with a man who carried a cold gun, Mick is super into the woman shooting ice daggers from her fingertips. So into her, in fact, that when Caitlin tells him Frost shows up when she’s angry or afraid, Mick literally yells “boo” at her. Also great? Formerly well-known Central City criminal Mick sitting next to Central City police captain Singh at the wedding made for a great “Don’t I know you?” gag. Mick has no shame whatsoever and we love it. The DC/CW shows are always managing to bring in TV superheroes of yesteryear, but last night’s cameo was still a bit of a surprise. The man officiating Barry and Iris’ wedding was played by William Katt, star of The Greatest American Hero in the early ‘80s. It wasn’t based on a comic book, so there’s no DC (or Marvel) easter egg there, but it was a nice cameo. Well, until the Nazis disintegrated him.